Taking medicine just got a whole lot sweeter! Honey is well known for its healing properties. When infused with the additional benefits of medicinal herbs and fruits, it turns natural remedies that can be unpleasant tasting into a treat to take. 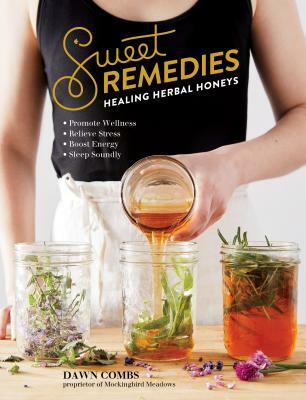 Author Dawn Combs makes these traditional herbal honeys — called “electuaries” — and has created her own formulations for addressing a variety of common health ailments. With Sweet Remedies, readers will learn her methods for making electuaries in their home kitchens, using recipes that range from Ache Ease and Sleep Well to Heartful and Calcium for Kids, along with instructions for making simple honey infusions and oxymels — a combination of herbs, honey, and vinegar. Additional recipes offer creative ways to get a daily dose of healing by using herbal honeys in no-bake cookies, smoothies, cocktails, candies, and more. For those with access to the hive, Combs includes an overview of other bee-produced products with healing properties — including pollen, propolis, and royal jelly — and offers advice on how to harvest them sustainably. Dawn Combs is the author of Sweet Remedies. She is the co-owner of the herbal health farm Mockingbird Meadows and the master formulator for a variety of the farm’s herb- and honey-based products. Trained in ethnobotany, she travels across the country to speak about botanical wellness and home health proficiency. She writes a column, Roots Rx, for Heirloom Gardener magazine and is a regular contributor to Mother Earth Living, Mother Earth News, and Hobby Farms. She has written two previous books about herbal healing. Combs lives with her family in central Ohio.